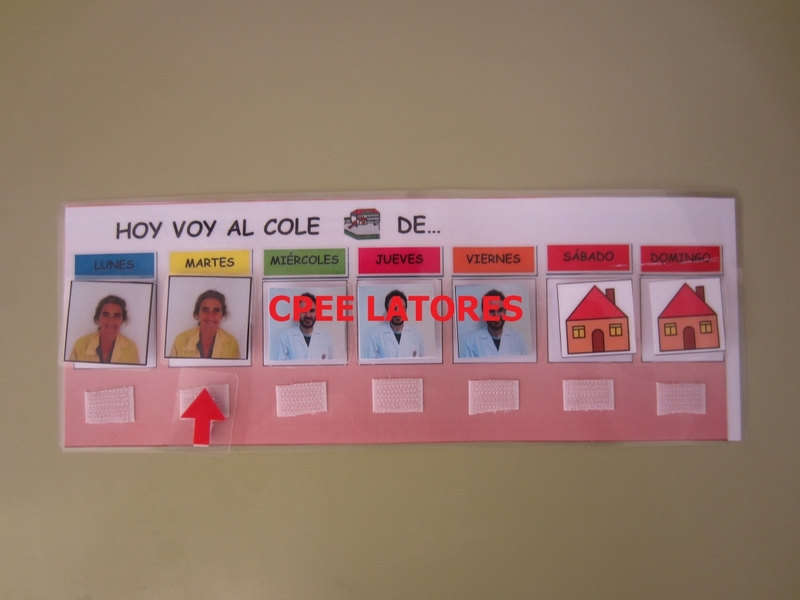 Description: Visual support aimed at clarifying to which school corresponds to go to students with autism enrolled in combined modality Prepared by the CPEE_Latores within the CREEME Project (Resource Center for Special Education and other Specific Measures). This project consisted in the conversion of the specific center into a resource center for the ordinary reference schools of students with autism enrolled in a combined modality. This visual support, in particular, was used by the families of the participating students to explain to their sons or daughters which school they had to attend according to the day of the week and for this they were advised by an itinerant teacher from the specific school who was traveling to the ordinary center to said work. Design of the support, preparation of photographs, selection of pictograms and explanatory text, lamination and cutting and implementation in the ordinary center by the itinerant teacher of the specific center.